So overwhelming is the Conservatives’ lead in the opinion polls that it is easy to overlook how precarious their future seemed not so very long ago. In the Summer of 2007, when Gordon Brown became Prime Minister, Tory leader David Cameron started off in a difficult position which got steadily worse; newspaper headlines on the eve of the Tory Party Conference were declaring him dead and buried. A series of calamities of varying magnitude followed for Brown, and the Tories came back from the brink. Nevertheless, even with several weeks of poll leads behind him, Cameron was still under pressure from the Tory right well into the Spring of 2008. There was a great deal of argument in March about why the Tory lead was so narrow. Now support for Brown has collapsed, and the Tories seem certain to get in. Well, maybe, maybe not; the electoral demography is still difficult for them, the electorate is volatile, the economy may improve and Brown will certainly come out fighting after his Summer break. Nonetheless, Tories are hot favourites. This seemed impossible after the last election, and much if not all of the credit must go to Cameron himself. The period 2005-6 was vital in the recovery of the Conservative Party, with the extraordinary seven-month leadership contest at the centre. The resurgence in Tory fortunes really began with Cameron’s famous conference speech of 2005, when he turned the contest on its head. 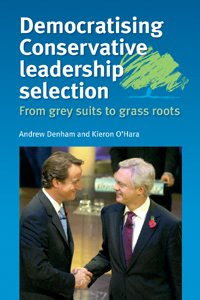 In our new book for Manchester University Press, Democratising Conservative Leadership Selection: From Grey Suits to Grass Roots, Andrew Denham and I examine the role of leadership contests in understanding the successes and failures of Conservative leaders. We provide a historical perspective back to 1881, and examine the conduct and effects of every Tory leadership election, with a detailed focus on the 2005 contest and the immediate aftermath. Cameron’s modernisation of the Conservative Party is key, bringing the party back to the centre, altering its rhetoric, changing the profile of its candidates and mapping out a conservative ideological space distinct from that of Thatcherism, as I had earlier argued was essential in my book After Blair (reviewed by David Cameron in The Guardian). Cameron changed both image and substance – and carefully used the change of image to reinforce the change of substance. Denham and I describe in some detail how the centrist project came under attack from Tory Ultras almost immediately, and how Cameron doggedly resisted – certainly making mistakes at times, but basically staying on course. We argued that the mandate from his decisive victory in the leadership election would be temporary, and that eventually Cameron’s legitimacy as leader would depend on electoral and poll success. At the time of writing the book, it was an open question whether Cameron would stay the course – perhaps an election called in Autumn 2007 would have derailed him. But he did not deviate, shrugged off the (false) accusations that he has no right wing ideological content, and is now reaping the benefits. He has certainly had some luck; nevertheless his long-term strategy, the forging of which during the dark days of 2005 is described in our book, is paying off much more quickly than he had a right to expect.